Before setting out, I read blogs and asked Christine of Jovial Wanderer for tips. It's my first time at Mt. Makiling and while I know that the mountain is notorious for leeches, I needed to hear it straight from fellow hikers. Leeches are active during the rainy season and have an uncanny preference for warm-blooded creatures. Since the trail we took was unpopular (we were the second group to use the Yakult trail), the leeches welcomed us with all their slimy heart (if they have one). I came armed with isopropyl alcohol in a spray bottle and wearing arm sleeves, long pants, and leggings. We left for the Yakult Trail around 8AM. We were navigating the steep ascent of the Yakult Trail fairly well until the typhoon made its presence felt. It rained while we were in the mossy forest and the leeches all came out to play. I saw them on my rain jacket, pants, gloves, and on my arm sleeves. It's easy to just flick them away when they're just on your clothing. The first time a leech made contact was on my lips. I thought I had mud that I couldn't get off. Luckily, a fellow hiker plucked it off quickly. Five minutes later, there was thunder and lightning, a tree shook from above, and I suddenly felt a limatik in my eye. I stopped midstep on a steep trail, closed my eyes and asked a fellow hiker to take it off from my eye. Fortunately, again, he was able to pull the sucker off before it began to feed. There were four of us in the group who had the bloodsuckers burrowing into our eyes. Watch the video and see how a leech was removed from a fellow hiker's eye. I think hers stayed for a little more than 2 hours. Since the leech was burrowed deep into the eye socket and could not be immediately removed, we continued to trek up to the summit. It seems that the leech had no intentions of feeding on her blood vessels so our team leader proceeded on removing the parasite. Wear tight clothing. Wear thick leggings, long pants, arm sleeves, gloves, and a scarf/headwear to cover your ears and head. If you have an extra scarf, wrap it around your neck. Have a spray bottle of alcohol or saline solution ready. If you see a leech on the process of attaching itself, spray alcohol on the bloodsucker like a crazy gunman. Keep your head down low. At some point during the trail, I looked up on a tree and I think that was the time the limatik jumped to my eye. Resist the urge to wipe the sweat off your face. Sweat has a small amount of salt which can drive away the bloodsuckers. Do a limatik check with your fellow hikers. Have fun! Don't let the limatik get the best of you. In our case, limatik bites were the least of our concerns. The steep, slippery, muddy trail made us forget them for a while. We reached the summit around 4PM and started the descent to Tabayak Camp via Los Banos trail at 4:30PM. Leeches were still all over the place but they were lesser in number compared to the ones on the Yakult Trail. It was an easy descent until we reached the campsite around 7:30PM. I was more than glad to finally sit back and relax for the night. Thanks to the team for a fun and equally challenging training climb! To more limatik experience in Amuyao! What a fun adventure! Limatiks are yucky, but they don't really do any real harm. 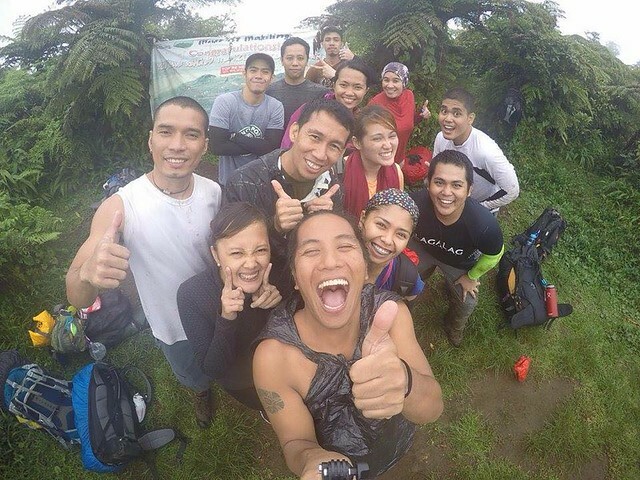 And thank you for your itinerary and budget; this will definitely help us in planning our Mt. Makiling climb. You're right.. they're harmless aside from the bloody bite. Great blog! Made me miss rapelling.